While we’re heading to Newport this weekend, I have to give a shout out to Rockygrass for an amazing lineup – one of the most exciting of the summer. This epic list includes Alison Krauss, Darol Anger, Della Mae, Bela Fleck, Ricky Skaggs, Julian Lage & Chris Eldridge, Noam Pikelny & Stuart Duncan and more. It’s a lineup is loaded with great pairings. 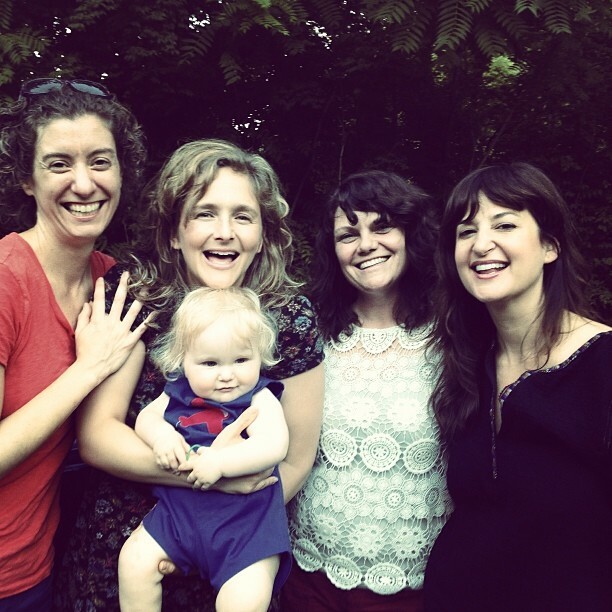 Of note, the ladies of Uncle Earl (Rayna Gellert, Abigail Washburn, KC Groves, Kristin Andreassen), who I first encountered at Telluride in 2005 (that’s pre-grass clippings), will play their first show together in six years. This week, I caught up with Andreassen (Guitar, Fiddle, Harmonica, Clogging and Vocals) to get the backstory. “We got together at Abby’s place in Nashville last week to practice, and it was amazing how it all came back. It’s been six whole years since this crew has played together, but it doesn’t feel like it could possibly have been that long. We’ve each had our own experiences in the time we’ve been apart (marriages, new records and tours, and even a baby) but I think our group sound is just stronger for what we each bring back to the band now. Uncle Earle plays Rockygrass at 5:30 PM MT on Saturday. Stream the festival via KGNU here. Check out this video of the band playing “The Girl I Left Behind Me” with Washburn’s mother-in-low (a.k.a. mother of Bela Fleck) and son Juno Washburn Fleck. Also note that Andreassen is currently running a Pledge Music campaign for her forthcoming album, Gondolier. Sample tracks, pre-order the album and check out the video backstory here. Andreassen is a a force in our little Brooklyn bluegrass community and we’re pumped about this album.